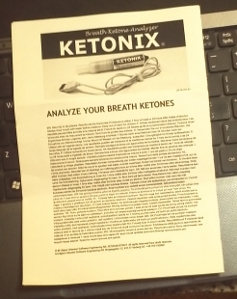 After nearly a month of waiting (I blame Jimmy Moore for making the Ketonix so incredibly popular that it was sold out for several weeks), I finally got my Ketonix Sport today, and decided to try it right away, although I expected that I would probably not be in ketosis. #3 is due to the fact that the sensor is the same one used in alcohol testers, and it’s about 200 time more sensitive to alcohol than to acetone. Not sure what #4 is all about. Maybe it’s to get rid of any gunk that might collect in the sensor, which is about 1.5 inches from the mouthpiece tip. 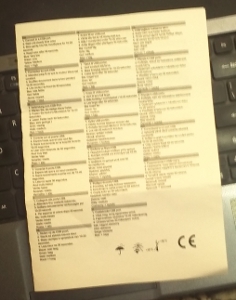 The same information was repeated 18 other languages, which explains the sea of tiny letters. Waiting for the steady blue color took a lot longer than I expected. I was about to conclude after a few minutes that I had gotten a defective unit, when it finally turned steady blue. I didn’t time myself blowing; I just blew very slowly for as long as I could stand it. About 5 seconds after I quit blowing, the unit started blinking green. 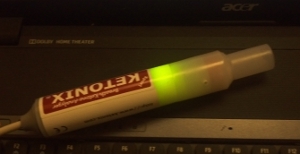 Light ketosis! Better than I expected. So now, I will be keeping a detailed food log, and running my n=1 ketosis experiment. I know from prior experience that just keeping a food log helps in a lot of ways, so I expect to lose a bit of weight just from that. Which means that I will need to account for that phenomenon when I announce the results. 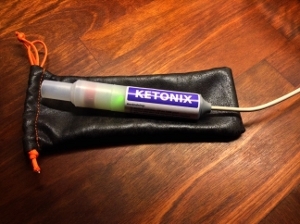 This entry was posted in Ketosis, Nutritional Research. Bookmark the permalink.